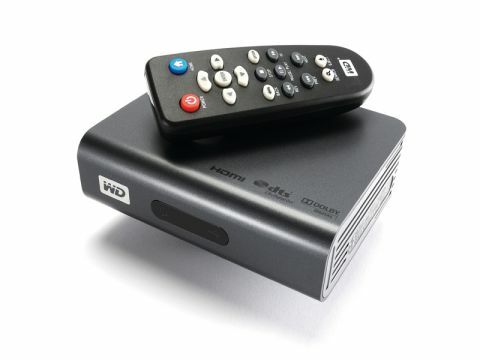 The WD TV Live is a full 1080p HD compatible media hub, which adds to the existing WD TV device with a 10/100 Ethernet port and the ability to decode DTS audio. Designed to connect directly to your TV, the WD TV eschews Wi-Fi, instead plumping for wired Ethernet, and is similar in scope and price to the £109 Netgear EVA2000. As you'd expect, the device will talk to network attached storage (NAS) boxes as well as enabling you to stream content from your PC. You can connect the device up to an HD TV via HDMI 1.3 or a standard composite video and audio RCA connector (the latter is supplied; the HDMI annoyingly but predictably isn't). As with the precursor WD TV, WD TV Live is pitched primarily as a unit into which you'd plug a device such as a USB stick or external hard drive to play back content you've stored there. This isn't as easy as accessing that content wirelessly, but the price point reflects this. While various wireless media streaming devices are available from the likes of Netgear and Buffalo, you pay a premium for this functionality. More interesting is the WD TV Live's ability to play content stored on devices like camcorders, cameras and mobile phones. With the ability to store and playback more media on our mobiles than ever, the phone is rapidly becoming an ideal place to keep your media – and the WD Live is ideally placed to take advantage of this trend. There are two USB ports on the machine to support up to two devices at once and you can also transfer files between them, such as from a camera to a USB hard drive. Web media access is also becoming an important function of media-streaming devices. While the WD TV Live only has YouTube and Flickr support at the moment, Western Digital says it will partner with other services in Europe (it has done so already in the US with radio streaming, for example). Our main bone of contention with the device is its almost old-fashioned attachment to wired Ethernet. The problem with Ethernet is the difference between the positioning of your TV and the positioning of your router. We don't know about you, but our router is nowhere near our TV. This isn't as major a point as it sounds because of the price point at which the WD TV Live is pitched, but it is annoying as you won't be able to access any internet content if your router is too far away. And, of course, you can always plug a wireless bridge into the Ethernet port. However, we believe Western Digital needs to add to its range with an 802.11n version of the kit (although it would add to the price significantly), shipping with the proviso that any potential purchaser would need an 802.11n router to transfer HD video. The WD TV Live is typical of the new breed of media playback devices in that it supports many file formats, including MKV and DivX video plus all the usual standards – though, as you'd expect, the device doesn't support protected content from places such as the iTunes Store. Gone are the days when streamers would only take a few formats. Media streaming is certainly becoming a more competitive marketplace and while cheaper media streamers are now available, watch out for lack of format support and also ensure you see a model in action before you buy it. Many streamers (especially slightly older ones) have painfully slow interfaces, something the WD TV Live doesn't suffer from. As prices are falling and reliability is improving, now is definitely the time to buy.